Darrell W. Gunter STM Director North America, is one of the leading advocates of consultative sales, semantic technology, mobile applications and social networking in the scholarly publishing industry. He is a frequent speaker and moderator at many information industry events espousing the benefits of semantic technology, mobile applications and social networking. Over the course of his 30+year career he has worked for the leaders of the electronic intellectual property industry. Xerox, Dow Jones Financial News Services, Elsevier, Collexis, American Institute of Physics and Allerton Press, Inc. His consultancy firm, Gunter Media Group, Inc. www.guntermediagroup.com, focuses on strategic management and the development and implementation of semantic technology applications. A graduate of Seton Hall University's Stillman School of Business, where he obtained his BS in Business Administration with a concentration in marketing and earned his MBA from Lake Forest Graduate School of Management. He also attended the Reed Elsevier Executive Management Development Program at Green College, Oxford University. Darrell is very active in the industry as his firm is a member of AAP PSP, SSP, American Chemical Society and SIIA. He is the Co-Chair of PSP’s Committee for Digital Information and has served on the SSP Marketing Committee. He is also an Associate Editor of the Learned Journal published by the Association of Learned Publishing and Professional Scholarly Publishers. He is an Adjunct Professor at Seton Hall University where he teaches consultative sales on the graduate and undergraduate level and lectures at Rutgers University Newark, NJ. 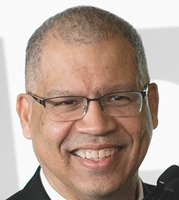 He serves on the non-profit boards of the Women’s Venture Fund, EIES of NJ, Greater Newark Enterprise Corporation and Seton Hall University’s Advisory Council. His radio program "Leadership" airs Saturday mornings at 8:00 am on WSOU HD 89.5 FM / WSOU.net and the podcast can be accessed via iTunes U http://bit.ly/1a1h8g3.